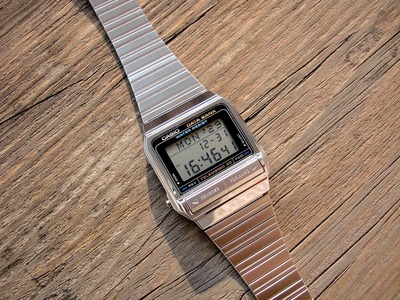 The Christmas before I started high school I was given a classic silver analogue watch as a Christmas present. A few years later I got my name engraved on the back of my watch. Since then I have owned numerous watches. A time came when I rarely wore a watch as I found I didn't need one. These days I rarely leave the house without a watch on my wrist as I use public transport and need to keep an eye on the time. I have found a watch can be a fun accessory as well as a useful item. 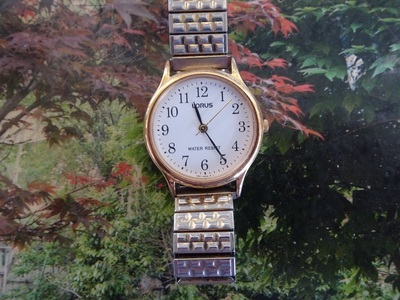 For some years I owned one watch, a small gold one I bought from Avon. I still wear it from time to time as I consider it 'goes' with just about everything. Unfortunately the gold colour is wearing off now from years of use. When my mother died I inherited her easy to read gold watch with a stretchy band. It is so quick to put on when I am in a hurry and I love the big numerals. I always think of Mum when I wear her watch. Some time back I realised I rarely wear a bracelet these days but I frequently wear a watch. To me this justified the purchase of more watches. 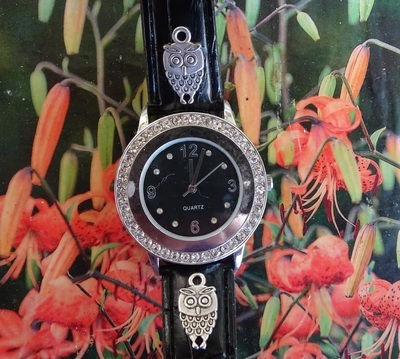 One day I saw a silver watch with a black band in an op shop. At $7 it was a good buy. I glued a couple of silver owls onto the band to add my own personality. Yes, I love owls. I bought a white and silver watch online. It is practical and attractive and fits with many of my outfits. I also bought a larger watch online. It has a dark brown band and is a brassy colour. There are various words in the background of the face. 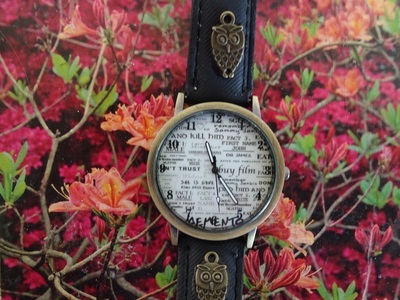 I sometimes choose to wear this watch when I am heading off to writers' group or another writing orientated activity. Again, I glued a couple of owls, this time bronze coloured ones, to the band. This watch says quite a lot about me. 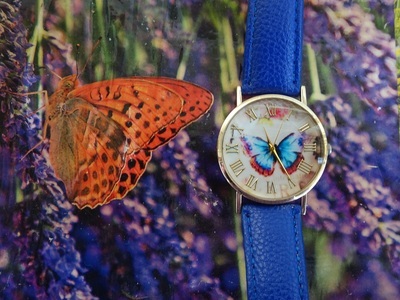 One day I saw a beautiful watch with a blue band and a butterfly on the face in a variety shop. I wanted it and at $15 it wasn't expensive. However, it was an impulse buy so I didn't purchase it there and then. I kept thinking about the watch and two weeks later returned to the shop and bought it. I have numerous items with the same shade of blue as the band so I think the watch looks nice with different outfits. 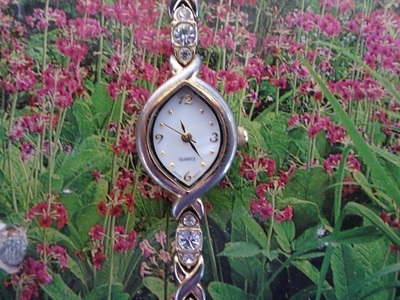 A watch may be inherited or received as a gift. 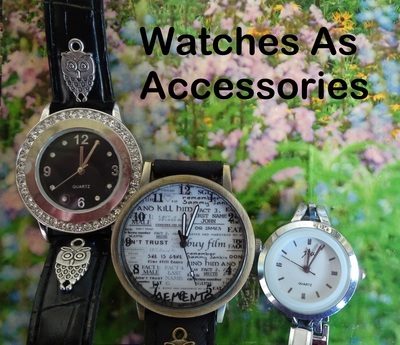 You can buy watches from a jewellers, variety store, department stores, op shop or online. There is a choice of analogue or digital. As well as being practical, a watch can add interest to what you are wearing. Some watches are classic and others shout, 'Hey, look at me.' 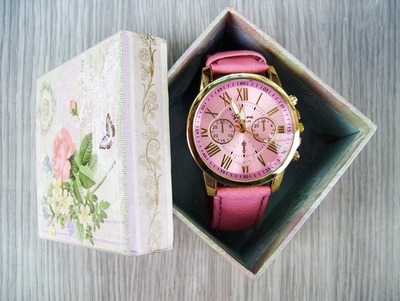 A watch can show your personality, whether that be quiet and understated or outgoing. 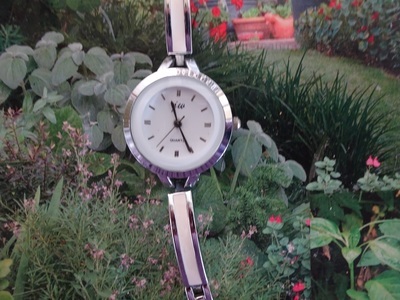 A watch can be dainty or big and if it has numerals these may be small or large. A few watches have Roman numerals, especially fob or pocket watches. Some people have no need for a watch and check their mobile phone when they need to to know the time. However, if you do like to wear a watch there is plenty of variety and a watch to suit whatever you are wearing.